Last week I talk about this project where I signed up. 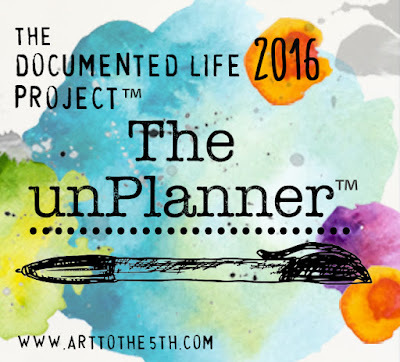 The Documented Life Project 2016: The UnPlanner. We are in week 2 and just like last week, I've been doing a summary of my week. The month's theme is: Trying something different! So this week I decided to make the week planner sheet and the list of "dare to be" everything by me. My chosen quote was "I love and I'm loved," and so my chosen word was Love / Loved. Then to get fancy, gathered the materials I have and created small art pieces, and add embellishments to my pages. I used a wood house that I will show to you how I did, next week, I used a photo and make a beautiful piece of collage and stitches. I made a Dare2Be list and made a dream catcher that is an object that I love to draw! I don´t know if I'm following all the directions that are being given to us! For not being pressed about it, my process is: I read the challenge ideas on Saturday. Then I turn off everything and do all at my own style and feeling. Na semana passada falei-vos deste projeto onde me inscrevi. The Documented Life Project 2016: The UnPlanner. Estamos na semana 2 e tal como na semana passada, venho fazer um resumo da minha semana. O tema do mês é :Trying something diferent! Então esta semana resolvi fazer a folha de plano da semana e a lista do "ousar ser" tudo à mão. A frase que escolhida foi "I love and I'm loved", e por isso a minha palavra foi Love/Loved. Depois dar asas à imaginação, pegar nos materiais que tenho e criar pequenos fragmentos de arte. This was a card from the week1 that i added in the weekend! The week 2 starts here! Este é ainda um cartão da última semana, que ainda acrescentei no fim de semana. A semana 2 começa aqui. Love it! It is really amazing! A wonderful unPlanner! Thanks for stopping by! Really appreciate!